In the fall of 2011 I was sent the album “Forced To Kill” by the German Heavy Metal band HEADLESS BEAST. HEADLESS BEAST was first known as BEAST OF BOURBON in 1999, but changed its name to its current monniker in 2004. In that year the band released the EP “Never Too Late”. Very early last year, on 2nd January, the debut full-length was put out, again by the band themselves. Titled “Forced To Kill”, it shows the band’s potential and skills to combine influences from Classic Rock, Hard Rock and Heavy Metal. 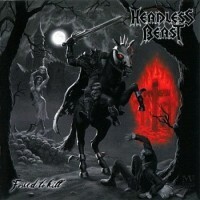 As I had never heard of HEADLESS BEAST until the review request, I cannot voice my opinion on the band’s EP. But let’s not look behind and focus on the present, i.e. “Forced To Kill”. The album contains twelve songs, totalling a playtime of a good 50 minutes. Responsible for production, mixing and mastering was Vagelis Maranis in his own studio. To be honest, I have never heard of the man or of SANVOISEN, but I can only say that he did a very fine job in giving the songs the proper sound. The artwork was done by Markus Vesper, while the name of the band was inspired by the legend of the headless horsemen by Washington Irving (“The Legend of Sleepy Hollow”, also made as a film by Tim Burton). The lyrics deal with various aspects of life: lies, deceit, exploitation, environmental damage, racism, murder, violence, and so on. It begins with “Black Rider” and its horses with the riders starting a fight. And then the music falls in, tension is created before the real take-off. Midtempo Hard Rock / Heavy Metal with double bass, all at a firm pace. The guitarwork (incl. the solo) is typical for this style, but very enjoyable. All in all, a simple song, like the others, but well done. “Riding With The Deadman” rocks in vein of SHAKRA (the Swiss Hard Rock band) or KALEDON’s “Chapter 5: A New Era Begins” (2008). And there’s a bit of IRON MAIDEN in the music as well. Another well done job and again the guitar solo stands out. Looks like Ingo thought things through. Another song that ROCKS! is “Deny The System”. It’s a simple song, but oh so catchy! So does the Bluesier “Burning Cross”, again comparable to SHAKRA’s tunes. The chorus is more melodic, thanks to Jürgen’s singing. The song’s rhythm allows for several headbang moments. Almost halfway and here’s my favourite track: “Maniac”. The speed goes up here and musically it’s in vein of IRON MAIDEN, SAXON, HELL, and so on. It’s great on all levels: rhythm, feel, tempo, … Excellent to get that energy boost or if you want to improve your mood. Time to let things rest in “Dying Day”, which is the ballad of the album. First acoustic, then with electric power. All in all, a very decent result, though in my humble opinion nothing special. A song by the book. “Mortal Fear” brings back to power of before. Heavy Metal rules here, with a very nice solo part. This is Metal à la ACCEPT, U.D.O. and similar. More Heavy Metal majesty can be found in “Evil Rules” with a higher quantity of melody. The midtempo playing during the solo is well done and helps to distinguish parts. “Forbidden Intentions” is a simple, straight-forward Heavy Metal track. Very listenable, too. Think of THE SCORPIONS, ACCEPT, U.D.O. and similar and you’ll know what to expect. However, I must add that here Jürgen’s singing was sometimes off the mark, particularly when reaching for higher notes. Not that it’s that much of a problem, just something I noticed. The start of “Forced To Kill” misleads you in that it could be a ballad, but the chugga-chugga riffing that follows takes that doubt away. Speed is not an issue here, rather feel and atmosphere, so to speak. So, no, don’t expect fast-paced Metal here, although for example a faster chorus wouldn’t hurt. The tempo does go up in “Run For Your Life”. It’s a solid track, though not that super. The guitar solo stands out, once more. Perhaps it’s because after a few tracks it’s clear what HEADLESS BEAST stands for that I find this song less super than those in the first half. “Headless Beast” is a slow, grooving track. Not that bad, but it offers just too much of the same. Could use more punch. So, a new (by manner of speech) Heavy Metal band has stepped up. To be honest, I quite liked “Forced To Kill”. The songs are not that technical, but that’s not always necessary. There’s Progressive Metal to fulfill those desires. HEADLESS BEAST nicely mixes influeces from Hard Rock and Heavy Metal, creating enjoyable tracks, but with critical lyrics. However, a bit more diversity (spread over the entire album, of course) would be nice, so you do not always get the same kind of songs, if you know what I mean. But long story short: HEADLESS BEAST can be proud of what they’ve achieved so far. Anyone into pure Heavy Metal should check out “Forced To Kill”.